Wednesday, Oct. 22, 7 p.m.
Calvary United Methodist Church, 48th and Baltimore Ave.
Tickets $10 in advance at Bindlestiff Books, $12 at the door. A benefit concert to support regional organizing efforts by the Industrial Workers of the World. 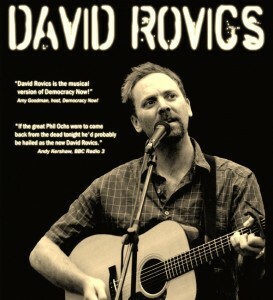 David Rovics sings and writes songs of social significance. Opening the show is Philadelphia favorite Cassendre Xavier. 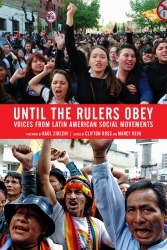 Bindlestiff Books will sponsor a presentation on Clifton Ross and Marcy Rein’s new collection, Until the Rulers Obey: Voices From Latin American Social Movements (PM Press, 2014), Monday, Oct. 20, at 7 pm at A Space, 4722 Baltimore Ave. This important new book includes interviews with more than 70 organizers, activists and scholars from 15 countries, Mexico to Argentina. They’ve mobilized on a broad range of issues, fighting against mines and agribusiness and for housing and land; for rights as women, workers, LGBT and indigenous people; for the survival of their communities and our planet. Their organizing runs the gamut of nonviolent social change strategies, from land occupation to electoral participation to creating alternative communities. Amazon’s minions have responded with a torrent of abuse. The Times report notes several instances where Amazon has made it difficult to impossible to find books (including one by the Republicans’ last vice presidential nominee) on its site as part of its effort to force publishers to submit to its terms, and others where it is offering up its authors’ ebooks as free alternatives to books by authors Amazon would rather not promote without getting a little extra on the side. *Amazon continues to choke back deliveries of Hachette-published books by as much as three weeks. We can’t claim to have every Hachette book in stock, but we will special order any in-print book you’re looking for and can usually get it in within a week. Bindlestiff Books is serving as a donation point for books for the All Hallow’s Read book swap. Bring your Halloween-appropriate children’s or young adult book and put it in one of the bins.